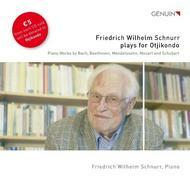 When a world-class piano pedagogue, a pianist of great importance like Friedrich-Wilhelm Schnurr, places his art at the service of a children's music project in Namibia, one can only take one's hat off to him. The fact that the Detmold Academy of Music, their students and the Leipzig Genuin label unselfishly support this project is also worthy of great respect. But when one places the CD into the player, only the music counts: the octogenarian's piano playing sounds youthful and powerful, gripping and tender. Schnurr plays the great small piano pieces of Mozart, Beethoven and Bach with a singing tone and a broad colour-spectrum. There are many reasons, therefore, for wishing this CD great success!